All jokes aside, I think this meme has an important message. First, it shows that as a teacher I can keep things fun and relevant. It is essential, even in a history classroom, to keep things modern and connect with students through a form of media they know all to well, memes. If I showed this meme the first day of school the kids would automatically feel comfortable as it is something they are familiar with. Secondly, the main point I am trying to get across in this meme is that every student has the right to be in the classroom. Every student is important and can contribute a significant amount. 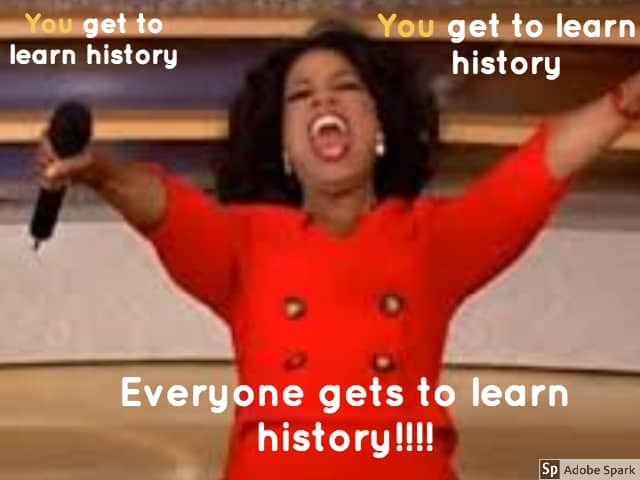 Therefore, even with the joke of Oprah Winfrey, the message is that every students gets to be an important member of the classroom while learning history (that will be connected to present day experiences).